CANGAMBLE: Let's Make Horse Racing Great Again! 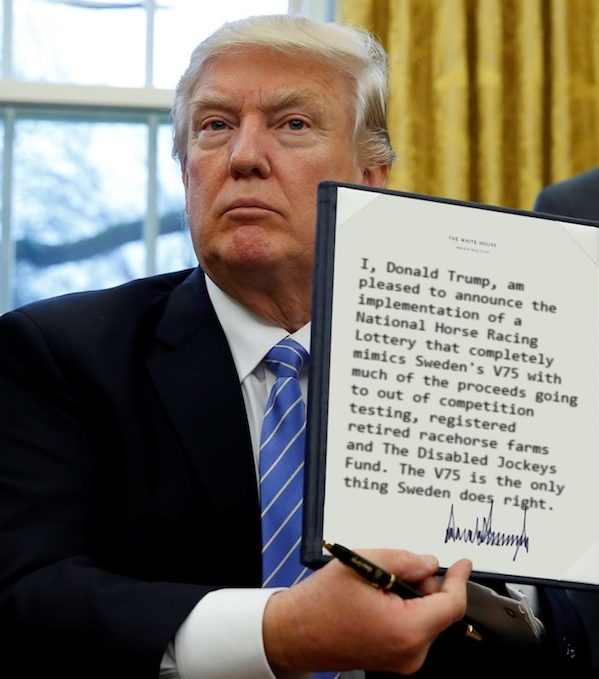 Let's Make Horse Racing Great Again! President Donald Trump took some time off Twitter to sign 8 executive order specifically having to do with horse racing. "Horse racing is a great American pastime. Many jobs depend on the game. But tragically, the game has been dying for years. It is so bad, that total handle went down even under Obama when just about everything including how much Americans gamble went up. I alone can fix horse racing and create many many more jobs in the process. Handle will triple in just two years thanks to these executive orders. Let's make horse racing great again!" "I know more about track takeout than the whales do. The lower the takeout, the more money that goes back into the gambler's pocket. And the gambler isn't going to spend that extra money on a course at Trump U., because Trump U. doesn't exist anymore thanks to the dishonest media, no, they are going to bet it back on the horses, and because they'll be able to bet more often, they will tell their family and friends how much fun they are having and how easy it is to bet on the races. Soon everyone in America, except the deceased, the illegal aliens and the minority of voters who voted against me, will be betting on the 7 horse in the Kentucky Derby. I saw something on Fox News that the 7 is a lock this year. As for the international 16% cap, I already have Russia and all their racetracks on board." "I listen closely to the people, and one of my biggest supporters, I forget the guy's name, told me about this breakage situation. It is so wrong. Gamblers should get back everything they have coming, and once again, the more they have in their pockets, the more they will bet, and the longer they will bet. I ran an extremely successful casino empire, I know all about churn, believe me." "Horse racing needs stars like the Kardashians. If the Kardashians retired to pop out babies, nobody would watch them. And this order should strengthen the breed too. The reason I'm the President at 70 today is because of great genes, everyone in my family has great genes, you don't see me retiring early, only people with bad genes retire early." "I know this race day Lasix ban is going to anger the Bernie Sanders supporting Left but it must be done. No Bernie, if a horse bleeds without Lasix, it shouldn't be given the opportunity to be on an equal playing field with a horse that doesn't bleed. 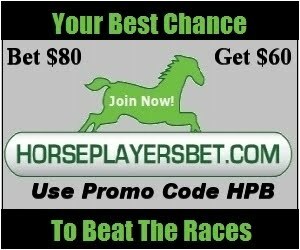 Really bad bleeders need to stop racing, and it is only a few horses that really bleed that much and because Lasix drains a horse, without Lasix horses will be able to come back and race more often, field size will actually increase, and I heard that bettors like bigger field size." "Drugs are killing the game. Super trainers don't even train their horses anymore, they just inject the same drugs illegal immigrants use before they swim across the Gulf of Mexico and land on the shores of Florida and Louisiana. These guys have super endurance, you must have seen them swim on TV like I have. This is bad and must be stopped. It will be stopped." "We will lower taxes on Americans, and abolishing taxes on racetrack winnings is a great way to start. Once again, the more money that is in the pockets of the gambler, the better off the industry will be in the long run. And I hate Jackpot bets, they are churn killers. My 50% tax will stop players from playing and then tracks will stop offering this silly wager and don't believe tracks who say that Jackpot bets create new players, that is Fake News!" "With every state now allowing horse racing betting, handle will go up bigly on that alone. And we'll see more states start building racetracks. If Florida had a racetrack I'd be spending my weekends at the track rather than on the golf course, and now they might build one, maybe even two. I also propose that the residing state of the gambler receives 1% of whatever is wagered by residents online, or 1% of what is wagered at tracks or OTBs. Lets face it, someone from South Carolina could be betting at a track in Pennsylvania but other than the holes in his jeans, how can you tell he is from South Carolina? On the internet it is different, you can tell. But some states are out of control on what they charge, Minnesota recently started charging and arm and a leg on their residents wagers, and now no betting company wants to take Minnesota residents except for illegal offshore bookmakers that help fund ISIS. This stops today." "I'm an expert on Sweden. If it wasn't for the V75 the only thing they'd have going for them are their meatballs. Most of the blonde women, and I do love women, have left or want to leave because of the daily terrorist attacks. I'd like to sign an executive order that allows a few hundred thousand blonde women from Sweden to come into America as refugees but I was told I could never get it passed." Canada will never go with the 16% cap. They think that 22% takeouts on Turfway Park triactors and other bets are too low and they pay out customers less than what the track pays. We race Standardbred horses. It is a known fact that all horses bleed to some extent. Lasix is the best control factor. It doesn't hurt a horse if you take care of him before and after racing. Vitamins, electrolytes, proper feed etc. We in the US do not have the treatments the Canadians or other countries have and use. If rule changes it will knock out most horses from racing, just the opposite of what is wanting to be done.